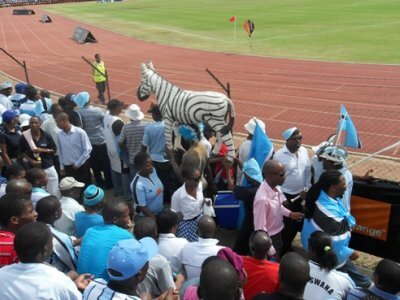 Botswana Zebras were drawn in a tough group for the coming African Nations cup also called AFCON to be held in January 2012. The tournament will be co-hosted by Equatorial Guinea and Gabon. The Zebras qualified for the tournament as group leader of the qualifying matches. They won five matches in all - Tunisia and Chad both home and away, Togo at home but lost a game away to them in the final group match, albeit already qualified, and drew home and away to Malawi. For AFCON 2012 the Zebras have been drawn against the tournament's favourite Ghana, and other tough opponents in Guinea and Mali. Botswana's opening match will be against Ghana. Follow all the updates on the Zebras before and When the AFCON 2012 tournament proper commences here. Given the pedigree of the group's opponents, we do not know whether Botswana should be worried or not. What are the Zebras made of? It being their maiden appearance in this tournament should Batswana still not expect less? What Africa does not know is that there will be as many Zebras followers in Gabon and Equatorial Guinea as its opponents whose countries are within proximity to the hosts. Batswana love their team and follow the stars wherever they go. Conversely, should Ghana, Guinea and Mali be worried by Botswana? What are the Zebras made of? They ask too. Give us your views below through the Facebook forum.